An update from the National Parks Association Qld. Welcome to the Spring edition of Protected. This edition emphasizes the importance of nature to us – human beings. An excerpt from Richard Louv’s book reinforces the importance of nature in childhood. The article on New Horizon’s Parallel Parks initiative shows how the use of digital technology can bring nature experiences to those who are physically unable to visit our special locations. Exposure to our natural world is so important that we humans are deploying new technology to ensure everybody can access it – as clear a demonstration as any why we need to cherish and protect our environment. You can download the 2018 annual report by clicking on the magazine cover. and distribute the link to your member networks, supporters and friends. OSCAR is part of the new SEQ Alliance that initiated this petition and we need the support of all our members and the community as a whole. Community interests must come before the interests of developers. WE MUST GET THIS MESSAGE TO THE STATE GOVERNMENT. Update: ….has been spotted all around Bribie in recent days. Seen floating15 metes out along Woorim beach on Sunday. Michael Savige says he has cuts/lacerations on his tail. Everyone is monitoring. If he becomes rundown no doubt Sea World, Aust Zoo or Thera will be called in. Right now he is being left alone in his natural environment. Best thing if possible. Taking him away could be quite traumatic and worse for him. JET skiers and boaties have been warned to take care in the waters around Bribie Island after an exhausted fur seal pup was washed up. …adds New Species and Updates to Some of our Most Popular Fish from Australia and Overseas. AMCS fisheries experts have released new updates to Australia’s Sustainable Seafood Guide for Australian seafood, including tuna, flathead and whiting. If you don’t yet have the App, download it from the App store here. If you already use it on your smartphone, make sure you update it to get the latest on our popular seafood. If you love your oceans and also your seafood, Victorian snapper and eastern school whiting get a green Better Choice. If you fancy tuna, then your catch might come with sea turtles, seabirds and even dolphins and whales. New addition John dory gets an Amber rating too. Shark from New Zealand gets a red Say No for the fishery’s impact on endangered Maui dolphins. Australia’s tuna and billfish fisheries now have mandatory cameras on board to check on what the longlines are catching in addition to fish. This welcome move gets a tick for transparency, but the cameras reveal a far higher incidence of protected species being caught or killed, such as sea turtles, seabirds, and dolphins. So if you eat tuna and swordfish you might want to think twice. Australia’s Commonwealth fisheries are lifting their game, but still have a long way to go. It’s hard to square claims of sustainability against the new information that threatened species are still being caught and killed in fishing gear. What’s more, this new data comes at a time when the marine park network that would have saved some of these critters is set to be slashed by the Turnbull government. Way down south in one of Australia’s largest fisheries¹, deep in the cool dark waters off our southern coast, innovative new measures are being brought in to scare away seabirds from trawlers and stop fishing if sea lions are killed in nets. This is good progress, which we commend. But overfished species continue to be caught, like orange roughy – ‘the old man of the sea’ that lives for a century or more on fragile underwater seamounts. While some stocks are improving, almost half have declined in the last decade despite major reforms aimed at their recovery. Australia claims to be a world leader in fisheries management, but if this is as good as it gets, our oceans are in trouble. But you can help turn the tide with Australia’s Sustainable Seafood Guide. Choose sustainable seafood and make a real difference by avoiding fisheries that harm our oceans and marine life. 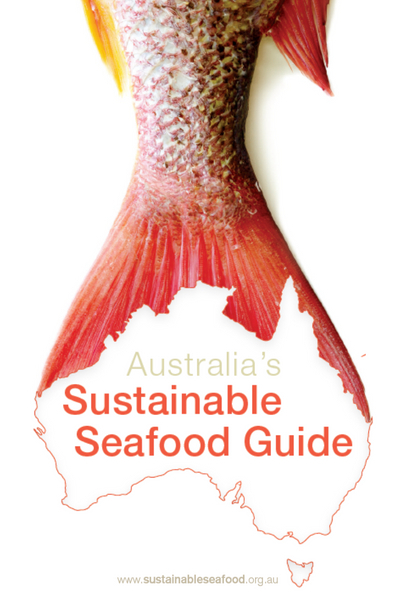 Australia’s Sustainable Seafood Guide is the only consumer guide seafood-lovers can rely on for 100 per cent independent advice about the sustainability of their fish. It’s easy to use, available as an App, and it’s free! How can we move Australian seafood from the red Say No and amber Think Twice ratings – to the Better Choice green list? Commonwealth fishery managers have shown a willingness to adopt best-practice management measures, and we are confident that with support of seafood lovers they will address the issues we’ve identified. We can do better than this. Australians can have thriving sustainable fisheries, robust marine parks and oceans full of marine wildlife. The green Better Choices in Australia’s Sustainable Seafood Guide are thanks to YOU demanding sustainable seafood, and the hard work of the fishing industry, fishery managers and conservationists responding to the challenge you’ve laid down – to put seafood on our plates in a way that protects our oceans and marine life. Will you make sustainable choices when buying seafood? Make the right choice by using Australia’s Sustainable Seafood Guide. P.S. Stay tuned for more updates rolling out over the coming months, as part of a comprehensive review of Australia’s seafood by AMCS fisheries experts. Download the app and start treading lightly today. Are You Ready to Reduce Your Use? Did you know that tomorrow Woolies supermarkets will no longer be giving out single-use plastic bags at their checkouts nationwide? This is great news and will help stop billions of plastic bags every year from being used for just a few minutes and then thrown away. Convenience doesn’t have to cost the Earth, and while they’re handy, these bags are one of the greatest threats to ocean wildlife. Over time they break up into smaller and smaller pieces – ending up in our oceans and our marine wildlife. Coles will be following suit and ban their bags on 1 July. This is the perfect chance for us all to do a plastic audit and see where we can take steps to reduce our plastic use. Many types of plastic we use daily can be easily swapped out with eco-friendly options, pretty much straight away. What can you swap out today?